84 children who have lost both their parents and don’t have relatives to care for them, MPI has created a welcoming house. The “Welcoming House” tries to reproduce the context of a family and a normal condition of life through the stable presence of adults who become for the children the affective and educative point of reference. Occasionally the Welcoming House offers emergency assistance to malnourished children. 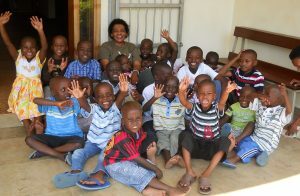 MPI caters for the school needs of 1,027 orphans and vulnerable children. It works with their parents/guardians in order to offer an authoritative point of reference for their growth and education. Meeting Point International through a project with AVSI Foundation, Support International and Insieme Si Puo’ has created a program that links Ugandan children with private donors who provide educational and other activities support. This rather unique project is further colored by the exchanges between sponsors/ who become friends and children in Uganda.